Note to all soccer fanatics: Chelsea Waterside Park is the place to be this weekend. Hosted by Adidas, twenty teams will compete for this year’s title as the reigning champ of the 10th Annual FANATIC/X Soccer Tournament. 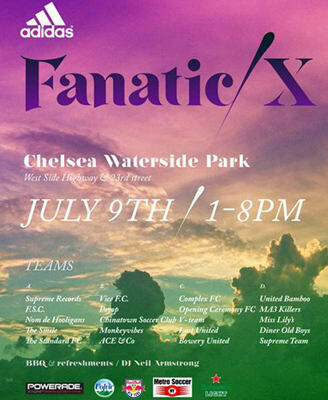 This year’s FANATIC teams include the ACE Hotel’s "ACE + CO," The Standard’s "The Standard FC," Miss Lily’s and, of course, Complex&apos;s own "Complex FC," taking a shot for the win on the field. DJ Neil Armstrong will be spinning on the ones and twos while guests can enjoy BBQ and beer sponsored by Heineken Light. Sounds like an epic Saturday to us, so come out and watch New York tastemakers and hipsters get broken by us.